This entry was posted in Authors and tagged Earthsea, Left Hand of Darkness, LeGuin, Neil Gaiman, Ursuls K LeGuin. Bookmark the permalink. Paula, I have a confession – haven’t yet read LeGuin – but I will!! Okay, if you were going to recommend a really good place to start where would it be??? Hi, Lynn. Thanks for stopping by. 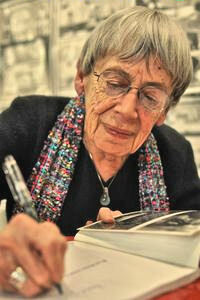 I am so happy that you want to read LeGuin! I have three most favorite reading experiences from her. My second favorite is the Left Hand of Darkness, solid science fiction, set on a world of human-like people who can be either male or female, depending on the whims of a monthly period of estrus and somewhat contingent on the current gender of any potential partners. Be prepared to have your brains thoroughly scrambled. My third favorite, considered by most to be her masterpiece and a truly masterful work, is The Dispossessed. It is rather cerebral, but not in an overpowering way, The main character is a genius-level mathematician who is regarded as unduly self-involved for the “ambiguous utopia” (LeGuin’s term) in which she has placed him. It is moving in ways much different from her fantasies. From there, just read whatever comes to hand, she never wrote anything bad or even seriously mediocre in her life. Her learning curve from the earlier (not bad, just early) science fiction works through the whole of her oeuvre is steep indeed. Hello to you too, Man of Many Thoughts, thank you for reading, and for your like.